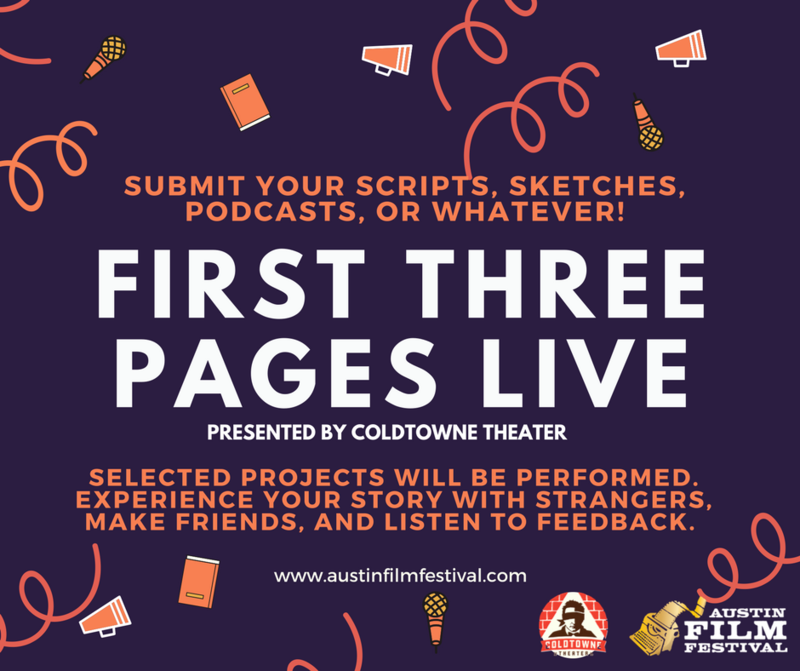 Austin Film Festival (AFF) prides itself on being a welcoming and inclusive environment for all voices and stories. The Festival is committed to providing a harassment-free experience to registrants of all genders, races, sexual orientations, ages, ethnicities, physical orientations, and religions. AFF reserves the right to revoke Badges and Festival privileges, without notice or refund, especially in regard to any threatening, discriminatory, or disrespectful behavior. This may include, but is not limited to: physical or verbal abuse or misconduct; sexual assault or unwanted sexual attention; violations of the law; stalking or bullying; inappropriate disruptions at official Festival events; and any other targeted or derogatory language, gestures, or actions that cause offense to another AFF registrant. If you notice violations of this Code of Conduct, you can alert on-site staff or email conduct@austinfilmfestival.com. Emergencies and infringements of the law should be reported to local law enforcement by dialing 911. Badges and Festival credentials are the property of AFF and can be revoked at any time, for any reason, at its sole discretion and without liability to AFF. Visit www.austinfilmfestival.com to review AFF’s Badge Policy in full. Accessible seating will be provided at all Conference & Film venues where seating is provided. All Austin Film Festival registrants must adhere to the Film Admission Policy. An accessible shuttle will be available for all shuttle routes provided. Service animals are welcome at all events in compliance with venue policies. Please contact info@austinfilmfestival.com or call (512) 478-4795 with any questions or concerns regarding accessibility accommodations. Film Admission Policy: Badge holders and Film Pass holders MUST be in line no later than 20 minutes prior to the scheduled start time. Priority admission is given to all Badge holders. Film Pass holders will be seated after all Badge holders have entered the theater. General Admission tickets will go on sale 20 minutes prior to each screening. Once General Admission tickets have gone on sale, Badge holders and Film Pass holders will no longer have priority admittance. Badge holders and Film Pass holders arriving AFTER the 20 minutes mark must go to the back of the General Admission line. ALL theater seating will be on a first come, first served basis. Neither Badge holders nor Film Pass holders are guaranteed a seat, only admission up to capacity. NO ONE will be admitted into the theater 15 minutes after start time. Austin Film Festival Staff will adhere to this policy even in the event of a delayed screening. All admission to Family Films will be on a first come, first served basis. * For admittance into parties, all attendees must be 21 or over. CROWD NOTICE: Please be advised that filming/taping is taking place in connection with the production of audiovisual projects for the Austin Film Festival (The “Project”) throughout the Conference and Festival. People entering the Festival & Conference areas may appear in The Project and in advertising in connection with The Project. By entering the area, you grant to Austin Film Festival, Inc., and its licensees/assignees the right to film and photograph you and record your voice, and to use your name, voice, and likeness, without compensation, in connection with the Project and the distribution and exploitation thereof in perpetuity and in all media now or later known, and you release Austin Film Festival, Inc. and its licensees/assignees from all liability in connection with these activities. You agree and understand that Austin Film Festival, Inc. is relying upon this grant and release. Austin Film Festival, Inc. DOES NOT ASSUME RESPONSIBILITY FOR ANY INJURY TO YOUR PERSON OR DAMAGE OR LOSS TO YOUR PROPERTY. If you are a festival badge holder, you will be accommodated on a first come, first served basis in regard to our established Film Admission Policy. When you arrive at a film venue, please check in with the Theater Manager on duty. You can receive a numbered queue card and will be allowed to wait in the lobby of the venue. If you have an aide who provides you assistance, he/she must have the same level of festival access as you, whether it be a badge or a film pass. If your aide has a badge, he/she can wait in the badge line and hold your numbered queue card for you. If you need continual access to your aide, he/she will be permitted to wait in the lobby with you. When the theater doors are opened to allow patrons in, you may enter the venue. If your aide is outside, he/she will have to wait and enter in order according to his/her numbered queue card. If you are a film pass holder, we cannot guarantee entry into a screening due to the priority access given to our festival badge holders. When you arrive at a film venue, please check in with the Theater Manager on duty and inform him/her that you are a film pass holder. The manager should be able to tell you at that time if you have a realistic chance of getting into the screening. If there is, you will be allowed to wait inside the lobby. If numbered queue cards are still available (after being distributed to the badge line) for guests in the film pass line, you will be issued a numbered queue card on a first come, first served basis while badge holders are being let in. If you have an aide with you who also has a film pass, he/she must remain in the film pass line and can hold your numbered queue card. If you require continual access to your aide, he/she will be permitted to wait in the lobby with you. Once all badge holders have been seated, you may enter the venue to take your seat. If you have an aide in the film pass line outside, he/she will have to wait and enter in order according to his/her numbered queue card. If there is still available seating after badge and film pass lines have entered the theater, general admission tickets will be sold at the merchandise table. Please be aware that, there is absolutely NO guarantee that general admission tickets will be available for a particular film, no matter how early you may arrive at a venue. When you arrive at a film venue, please check in with the Theater Manager. The manager should be able to tell you if there is a realistic chance of getting into the screening. If the venue reaches capacity with badge and film pass holders, there will not be any general admission tickets sold for the screening. If tickets are being sold and you wish to purchase one (1) general admission ticket, someone (either you or your aide) will have to wait in the general admission line to purchase a ticket. If you have an aide accompanying you, you are welcome to wait in the lobby until he/she purchases a ticket for both you and his/herself, and then you may enter the theater. If you require continual access to your aide, they will be permitted to wait in the lobby with you. We do advise any festival goers who may be in a wheelchair, on crutches, or use any other apparatus to assist with mobility to arrive at a venue at least one hour prior to the scheduled start time of the event. Austin Film Festival will provide American Sign Language (ASL) interpreters at select Conference panels. Austin Film Festival’s Pocket Guide will note which movies are close-captioned or subtitled. American Sign Language interpreting during film screenings. Personal or individually prescribed devices, such as wheelchairs, prescription eye glasses or hearing aids. Services of a personal nature, such as assistance in eating, toileting or dressing. Early seating. All hearing impaired patrons must adhere to our registrant panel and conference admission policies. Austin Film Festival provides one (1) wheelchair accessible shuttle to registrants for each standard shuttle route. The accessible shuttle will only travel on shuttle routes and stop at shuttle stops. For complete details on shuttles provided by Austin Film Festival during the festival, please contact:transportation@austinfilmfestival.com. For any questions relating to Austin Film Festival & Conference accessibility for registrants with disabilities, please email: info@austinfilmfestival.com or call (512) 478-4795. When ordering or registering on our site, as is appropriate, you may be asked to enter your name, email address, mailing address, phone number or credit card information. To send periodic emails: The email address you provide for order processing may be used to send you information and updates pertaining to your order. You may also receive occasional company news, updates, and related product or service information, etc. We offer the use of a secure server. All supplied sensitive/credit information is transmitted via Secure Socket Layer (SSL) technology and then encrypted into our payment gateway provider’s database, where it is only accessible to those authorized with special access rights to such systems. The payment service provider is required to keep the information confidential. We do not sell, trade, or otherwise transfer to outside parties your personally identifiable information. This does not include trusted third parties who assist us in operating our website, conducting our business, or servicing you, so long as those parties agree to keep this information confidential. We may also release your information when we believe release is appropriate to comply with the law, enforce our site policies, or protect our or others’ rights, property or safety. However, visitor information that does not personally identify users may be provided to other parties for marketing, advertising or other uses. FOR THE DRISKILL AND INTERCONTINENTAL STEPHEN F. AUSTIN (EFFECTIVE AUGUST 17, 2012) Cancellations must be made through Austin Film Festival (“AFF”) in writing no later than 11:59pm CST on September 20th, 2017. As of September 20th, 2017, any full cancellation at the above properties will be charged for one room night’s stay on the credit card you provided. At 96 hours before your scheduled check in or afterwards, your cancellation is also subject to the hotel’s cancellation fees (cancellation fees vary by hotel). Any cancellations must be sent to hotels@austinfilmfestival.com and include “Room Cancellation” in the subject line. To ensure that we have received it, please call Austin Film Festival at 512-478-4795 to confirm receipt of your e-mail. AFF will then send a cancellation confirmation number to the email provided. You must have a cancellation number confirming your cancellation request.Prior to check in, reservations made through Austin Film Festival cannot be cancelled through the hotel. AFF is not responsible for charges due to late cancellations or attempts to make changes through the hotel. FOR THE WESTIN, JW MARRIOTT, HILTON AUSTIN, COURTYARD MARRIOTT, SHERATON, HOLIDAY INN, LA QUINTA AND CROWNE PLAZA: Cancellations must be made through Austin Film Festival in writing no later than 96 hours before the day of your check-in. Please send your cancellation request to hotels@austinfilmfestival.com and include “Room Cancellation” in the subject line. To ensure that we have received it, please call Austin Film Festival at 512-478-4795 to confirm receipt of your email. Austin Film Festival is not responsible for charges due to late cancellations or attempts to make changes through the hotel. IMPORTANT: Please note that all hotel reservations are subject to the respective hotel’s reservation and cancellation policies, over which AFF has no control. Such policies may include but are not limited to a hotel’s right to repurchase your room reservations made in connection with the Austin Film Festival. In the event your reservation is cancelled by the hotel for any reason, you acknowledge that AFF is not responsible for securing alternative accommodations for you or refunding any AFF purchases made.